Angola, Benin, Botswana, Burkina Faso, Burundi, Cameroon, Central African Republic, Chad, Republic of the Congo, Democratic Republic of the Congo, Ivory Coast, Egypt, Eritrea, Ethiopia, Gabon, Gambia, Ghana, Guinea, Guinea-Bissau, Kenya, Lesotho, Malawi, Mali, Mauritania, Mozambique, Namibia, Niger, Nigeria, Rwanda, Saudi Arabia, Senegal, Somalia, South Africa, Sudan, Swaziland, Tanzania, Togo, Uganda, Yemen, Zambia, and Zimbabwe. Their preferred habitats are wooded savannahs, thorn bush and open woodlands; occasionally near urban areas. They are usually non-migratory; however, juveniles usually disperse after the breeding season. 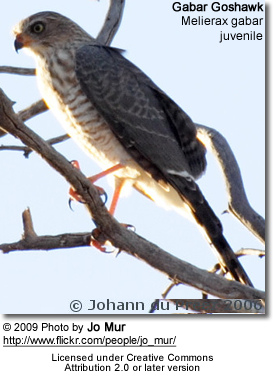 The Gabar GosHawks are generally solitary; however, during the breeding season, they are often found in pairs. Two color phases of the Gabar Goshawk occur in the wild - a pale phase and a dark phase. The more common pale form has a grey back and head, a white rump and a dark grey barred tail. The plumage below is white and grey barred. The rarer dark form, which makes up only about 25 percent of the overall population, is nearly all black. 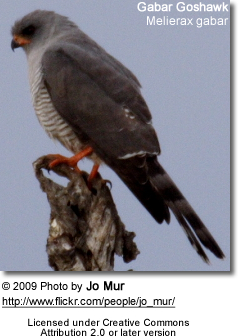 Gabar Goshawks have dark eyes and bare, red patches of skin around the base of the skin (called: cere). The legs and the cere of juveniles are yellow. Their plumage is browner and the pale phase immature birds have less well defined barring on the chest. Males and females look alike; except the females are generally significantly larger, weighing about 5.9 - 8.5 oz (167 - 240 grams) compared to the male's weight ranging from 3.2 - 6.1 oz (90 - 173 g). 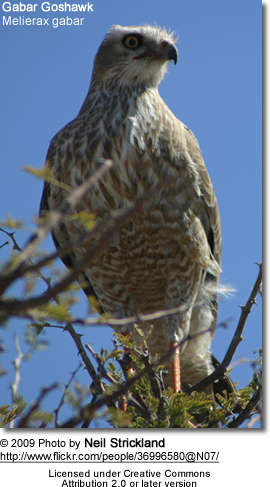 Garbar Goshawks mostly feed on small birds and their nestlings, as well as taking small mammals, reptiles and insects. Their prey is usually flushed from trees and caught following a chase. They also hunt from a perch, swooping down to catch prey off the ground or in flight. The platform nest is constructed out of thin twigs and situated on vertical forks in the crowns of thorny trees. When building the nest, these birds of prey usually incorporate spiders on their webs around the nest; it is believed that these spider webs camouflage the nest and the spiders consume parasites that would otherwise feed on the chicks. The average clutch consists of two eggs, which are incubated for about 28 - 30 days to hatching.